"Unchained Melody" is a 1955 song used as a theme for the little-known prison film, Unchained. 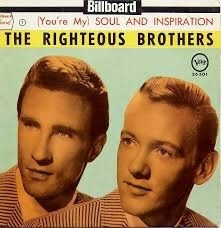 This week we feature a version of this song performed by “The Righteous Brothers” a musical duo of Bobby Hatfield and Bill Medley. This song climbed to number 4 on the Billboard Hot 100 chart in 1965 and reached number 14 in the UK in 1965. It was also used in the box office blockbuster film Ghost in 1990.